The concept of homogeneity plays a critical role in statistics, both in its applications as well as its theory. 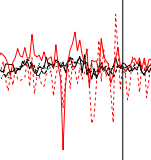 Change point analysis is a statistical tool that aims to attain homogeneity within time series data. This is accomplished through partitioning the time series into a number of contiguous homogeneous segments. The applications of such techniques range from identifying chromosome alterations to identifying economic recessions to solar flare detection. Our work in this area focuses on nonparametric estimation of both the number of change points and the positions at which they occur. James, N.A. and Matteson, D.S.